They're doin' the E Street Shuffle. She drives all them local boys insane. Little Angel says, "Oh, everybody form a line. Oh, everybody form a line." All the kids are dancin'. 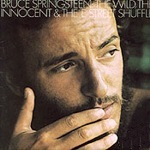 "The E Street Shuffle" has been performed live a total of 127 times.